While measures of a school’s academic performance (such as test scores) are important, we know from experience that parents crave a far broader perspective on the schools they’re considering. 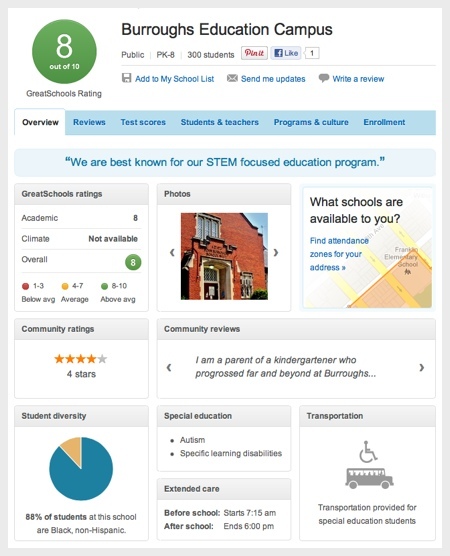 In response, we at GreatSchools have enhanced our school profiles by collecting and providing details on school culture, climate, and programs. And, we’ve made this information available to readers in a simpler, more comprehensible format. “School Profiles” have always been the core of the GreatSchools mission, and with the roll out of our new profile design, we have already begun to see parents spending more time on the site, viewing more pages, and considering more options than ever before. We’ve created a new feature that allows representatives of schools and organizations to contribute to their schools’ profile and provide details about their institution’s strengths and unique programs. If you are a school leader or influence school leaders, we’d appreciate you passing information about this feature along so we can keep improving our school profiles. To help families learn about their school’s Programs & Culture or Enrollment options, we’re collecting more data and information. We’ve also created ways to filter a set of schools according to factors parents care about most. We have also begun improving our GreatSchools rating in Milwaukee, DC, and Indianapolis to include additional data about school climate, college-readiness, and growth. We’ll continue this effort throughout the coming year. Finally, in many parts of the country, families are restricted in their school choice by enrollment boundaries. Our new School Attendance Zones tool helps parents simplify their search by focusing only on the schools that their child can actually attend. As you read this, all of these improvements are being rolled out nationwide. We look forward to continuing to serve America’s families in their search for a high quality, good-fit education for their child. GreatSchools would like to thank the Walton Family Foundation whose generous support made it possible for us to design and develop the new school profiles!